MBARARA – President Yoweri Museveni has ordered the extension of free legal aid services to the barracks of Uganda People’s Defence Forces (UPDF) to enable soldiers, who require legal aid with respect to handling land and other property in their home districts be assisted. “Let the soldiers be assisted to handle legal matters about their land and property, he said adding that the role of a soldier is to protect the country and that they do not have time to follow up legal matters on their own. “A government Surveyor and a Legal Officer should be stationed at every Division to handle soldiers’ legal matters on land, at free cost,” he said. 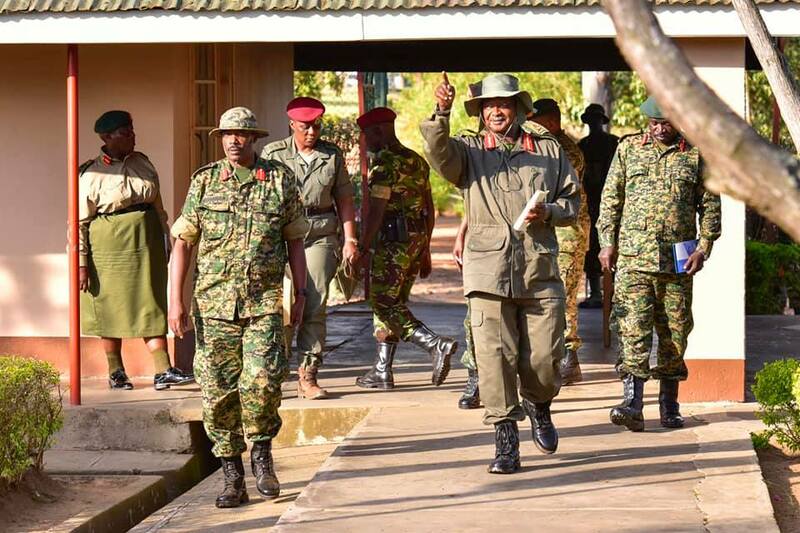 The President who is currently on a countrywide tour of Army Barracks, was Saturday April 06, responding to questions raised by soldiers after his address to UPDF Officers and men of the 2nd Division Simba Barracks in Mbarara Municipality. He also reminded them that they are members of the liberation army who must shun unprincipled divisions of tribes and religion, among others, and only work for the protection of the country and wananchi. The President lauded the achievements Uganda has realized in the health and education sectors, among others, adding that because of the policy of immunization, along with mass education, life expectancy in Uganda has gone up with the population currently at 41 million up from 14 million in 1986. He encouraged soldiers to produce children that they can afford to look after. He also strongly advised them to take good care of their health. Regarding the prosperity, Mr. Museveni emphasized that everyone should strive to make a contribution in the production of goods and services. He, at this, pledged Shs.100 million to support the SACCO of the soldiers’ spouses in the Division to help them further sustain and enhance their various income generating activities.